We're loving this weekend's upcoming events. So many opportunities to see a unique side of Vancouver. We've got the chance to peruse through a musical forest, explore neighbourhood gardens, and watch theatre under the stars. Not bad right? I am just hoping for sun. On that note, if you missed last week's Folk Festival due to the bad weather, read a full review. This weekend is guaranteed to be filled with sun (we promise!) so what better way to spend some time outside than a walking tour of gardens in the Hastings-Sunrise Neighbourhood? The homes and community gardens on the tour all have in common the theme of sustainability – whether that be vegetable gardens, xeriscaping, backyard chickens and bees or boulevard farming initiatives. The purpose of our tour is to inspire ecological and aesthetic practices, demonstrate good food security, and introduce people to one another. Plus it gives each of us a chance to peek into our neighbours’ backyards. 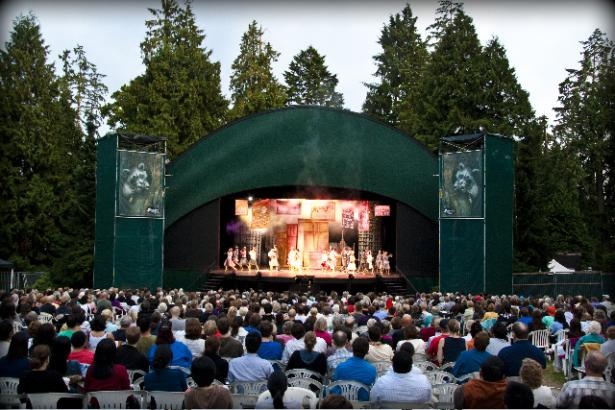 Theatre Under the Stars presents its 65th season with 2 award-winning musicals under the stars in beautiful Stanley Park. Two musicals alternate each night with ‘Bye Bye Birdie’, which is set in 1960 as teenagers all across North America are going crazy for rock star, Conrad Birdie. The second musical is ‘Anything Goes’ features the wonderful music by Cole Porter. The set is the S.S. American, sailing from New York to England, carrying an unusual group of passengers. Come to Robson Square for the Summertime Dance Series. DanceSportBC hosts these dance events, which feature, free lesson, demonstrations and social dancing at the downtown outdoor venue. A typical evening starts at 8pm for a free dance lesson with demonstrations at 9 and 10pm. Between these events is social ballroom and Latin dancing.